رضایی گلستانی, محمد رضا, خنجری, علی, میثاقی, علی, آخوندزاده بستی, افشین, عبدالخانی, علی, فیاض‌فر, سمیرا. (1397). طراحی فیلم‌های بسته بندی ضد میکروبی زیست تخریب پذیر بر پایه پلی‌لاکتیک اسید حاوی ترکیبات زیست فعال. مجله صنایع چوب و کاغذ ایران, 9(2), 153-162. محمد رضا رضایی گلستانی; علی خنجری; علی میثاقی; افشین آخوندزاده بستی; علی عبدالخانی; سمیرا فیاض‌فر. "طراحی فیلم‌های بسته بندی ضد میکروبی زیست تخریب پذیر بر پایه پلی‌لاکتیک اسید حاوی ترکیبات زیست فعال". مجله صنایع چوب و کاغذ ایران, 9, 2, 1397, 153-162. رضایی گلستانی, محمد رضا, خنجری, علی, میثاقی, علی, آخوندزاده بستی, افشین, عبدالخانی, علی, فیاض‌فر, سمیرا. (1397). 'طراحی فیلم‌های بسته بندی ضد میکروبی زیست تخریب پذیر بر پایه پلی‌لاکتیک اسید حاوی ترکیبات زیست فعال', مجله صنایع چوب و کاغذ ایران, 9(2), pp. 153-162. رضایی گلستانی, محمد رضا, خنجری, علی, میثاقی, علی, آخوندزاده بستی, افشین, عبدالخانی, علی, فیاض‌فر, سمیرا. طراحی فیلم‌های بسته بندی ضد میکروبی زیست تخریب پذیر بر پایه پلی‌لاکتیک اسید حاوی ترکیبات زیست فعال. مجله صنایع چوب و کاغذ ایران, 1397; 9(2): 153-162. زیست‌تخریب‌پذیری و فعالیت ضد میکروبی مواد بسته‌بندی مواد غذایی از مهم‌ترین پارامتر‌های صنایع مدرن بسته‌بندی مواد غذایی به شمار می‌آیند. برای توسعه و ارتقاء فیلم‌های پلی لاکتیک اسید به کامپوزیت‌های ضد باکتریایی، غلظت‌های مختلف اسانس آویشن شیرازی و یا عصاره اتانولی بره‌موم به کمک روش قالب‌ریزی به پلی‌مر اضافه گردید. فعالیت ضد‌میکروبی کامپوزیت‌های حاصل با کمک روش انتشار دیسک علیه چهار پاتوژن رایج غذازاد مورد بررسی قرار گرفت. نتایج نشان داد که فیلم‌های طراحی شده به طور موثر علیه همه باکتری‌های مورد آزمایش عمل کردند و کامپوزیت‌های حاوی اسانس آویشن شیرازی ظرفیت مناسبی برای محدود کردن رشد باکتری‌های بیماری‌زای مواد غذایی از خود به نمایش گذاشتند. همچنین اضافه شدن عصاره بره‌موم به فیلم‌های حاوی اسانس آویشن ویژگی‌های ضد ‌باکتریایی فیلم‌ها را کمتر از انتظار افزایش داد که احتمالاً طبیعت آبگریزی با آبدوستی اجزاء تشکیل‌دهنده فیلم‌های فعال تولید شده نقش مهمی در بروز این نتایج داشته است. بر اساس نتایج این مطالعه و سایر مطالعات مشابه، پلی‌مر زیست‌تخریب‌پذیر پلی لاکتیک اسید می‌تواند به عنوان یک پلی‌مر پایه مطلوب برای طراحی و توسعه فیلم‌های ضد میکروبی نوین مخصوصاً در ترکیب با اسانس‌های ضدمیکروبی گیاهی مطرح باشد. Malhotra, B., Keshwani, A. and Kharkwal H., 2015. Antimicrobial food packaging: Potential and pitfalls. Frontiers in Microbiology, 6:1–9. Tornuk, F., Hancer, M., Sagdic, O. and Yetim, H., 2015. LLDPE based food packaging incorporated with nanoclays grafted with bioactive compounds to extend shelf life of some meat products. LWT - Food Science and Technology, 64(2):540–6. Shameli, K., Ahmad, M., Bin, Yunus, W.M., Ibrahim, N.A., Rahman, R.A., Jokar, M. and Darroudi, M.., 2010. Silver / poly (lactic acid) nanocomposites : preparation , characterization , and antibacterial activity. International Journal of Nanomedicine, 5:573–9. Jamshidian, M., Tehrany, E.A., Imran, M., Jacquot, M. and Desobry, S., 2010. Poly-Lactic Acid: Production, Applications, Nanocomposites, and Release Studies. Comprehensive Reviews in Food Science and Food Safety, 9(5):552–71. Woraprayote, W., Kingcha, Y., Amonphanpokin, P., Kruenate, J., Zendo, T., Sonomoto, K., Benjakul, S. and Visessanguan, W., 2013. Anti-listeria activity of poly(lactic acid)/sawdust particle biocomposite film impregnated with pediocin PA-1/AcH and its use in raw sliced pork. International journal of food microbiology, 167(2):229–35. Salmieri, S., Islam, F., Khan, R. a., Hossain, F.M., Ibrahim, H.M.M., Miao, C., Hamad, W.Y. and Lacroix, M., 2014. Antimicrobial nanocomposite films made of poly(lactic acid)-cellulose nanocrystals (PLA-CNC) in food applications: part A—effect of nisin release on the inactivation of Listeria monocytogenes in ham. Cellulose, 21(3):1837–50. Javidi, Z., Hosseini, S.F. and Rezaei, M., 2016. Development of flexible bactericidal films based on poly(lactic acid) and essential oil and its effectiveness to reduce microbial growth of refrigerated rainbow trout. LWT . Food Science and Technology, 72:251–60. Irkin, R. and Esmer, O.K., 2015. Novel food packaging systems with natural antimicrobial agents. Journal of Food Science and Technology, 52(10):6095–111. Burt, S., 2004. Essential oils: their antibacterial properties and potential applications in foods--a review. International journal of food microbiology, 94(3):223–53. Sajed, H., Sahebkar, A. and Iranshahi, M., 2013. Zataria Multiflora Boiss. (Shirazi thyme)--an ancient condiment with modern pharmaceutical uses. Journal of ethnopharmacology, 145(3):686–98. Maurício, J. and Bankova, V., 2011. Propolis : Is there a potential for the development of new drugs . Journal of ethnopharmacology, 133:253–60. Probst, I., Sforcin, J., Rall, V., Fernandes, A. and Fernandes Júnior, A., 2011. Antimicrobial activity of propolis and essential oils and synergism between these natural products. Journal of Venomous Animals and Toxins including Tropical Diseases, 17(2):159–67. Alencar, S.M., Oldoni, T.L.C., Castro, M.L., Cabral, I.S.R., Costa-Neto, C.M., Cury, J. a., Rosalen, P.L. and Ikegaki, M., 2007. Chemical composition and biological activity of a new type of Brazilian propolis: red propolis. Journal of ethnopharmacology, 113(2):278–83. Bryan, J., Redden, P. and Traba, C., 2015. The Mechanism of Action of Russian Propolis Ethanol Extracts Against Two Antibiotic Resistant Biofilm Forming Bacteria. Letters in applied microbiology, 62(2):192–8. Bodini, R.B., Sobral, P.J.A. and Carvalho, R.A., 2013. Properties of gelatin-based films with added ethanole propolis extract. LWT - Food Science and Technology, 51:104–10. Abdulkhani. A., Hosseinzadeh, J., Ashori, A., Dadashi, S. and Takzare, Z., 2014. Preparation and characterization of modified cellulose nanofibers reinforced polylactic acid nanocomposite. Polymer Testing, 35:73–9. Shavisi ,N., Khanjari, A., Basti, A.A., Misaghi, A. and Shahbazi ,Y., 2017. Effect of PLA films containing propolis ethanolic extract, cellulose nanoparticle and Ziziphora clinopodioides essential oil on chemical, microbial and sensory properties of minced beef. Meat Science, 124(July 2014):95–104. Özge Erdohan, Z., Çam, B. and Turhan, K.N., 2013. Characterization of antimicrobial polylactic acid based films. Journal of Food Engineering, 119(2):308–15. Solano, A.C.V. and de Gante, C.R., 2012. Two Different Processes to Obtain Antimicrobial Packaging Containing Natural Oils. Food and Bioprocess Technology, 5(6):2522–8. Jin, T., Liu, L., Zhang, H. and Hicks, K., 2009. Antimicrobial activity of nisin incorporated in pectin and polylactic acid composite films against Listeria monocytogenes. International Journal of Food Science and Technology, 44:322–9. Liu, D., Li, H., Jiang, L., Chuan, Y., Yuan, M. and Chen, H., 2016. Characterization of Active Packaging Films Made from Poly ( Lactic Acid )/ Poly ( Trimethylene Carbonate ). Molecules, 21(6):695. Tawakkal, I.S.M.A., Cran, M.J. and Bigger, S.W., 2016. Release of thymol from poly(lactic acid)-based antimicrobial films containing kenaf fibres as natural filler. LWT - Food Science and Technology, 66:629–37. 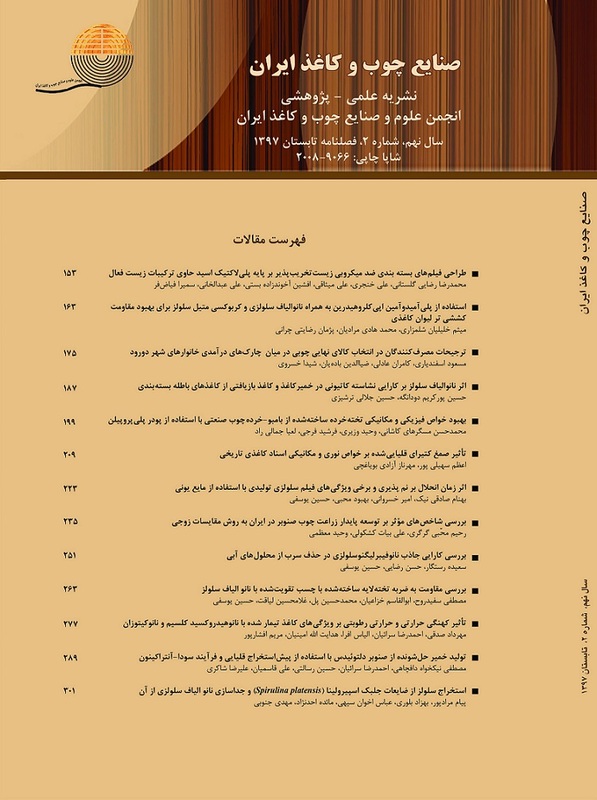 Moosavy, M.H., Basti, A.A., Misaghi, A., Salehi, T.Z., Abbasifar, R., Mousavi, H.A.E., Alipour, M., Razavi ,N.E., Gandomi, H., Noori, N., 2008. Effect of Zataria multiflora Boiss. essential oil and nisin on Salmonella typhimurium and Staphylococcus aureus in a food model system and on the bacterial cell membranes. Food Research International, 41(10):1050–7. Abdulkhani, A., Hosseinzadeh, J., Ashori, A. and Esmaeeli, H., 2015. Evaluation of the Antibacterial Activity of Cellulose Nanofibers / Polylactic Acid Composites Coated with Ethanolic Extract of Propolis. Polymer Composites, 38:1–7.